WKFA was voted “Diamond – #1 Winner for favourite local Martial Arts studio” in The Record 2017 Reader Awards again this year! Thank you for your support! 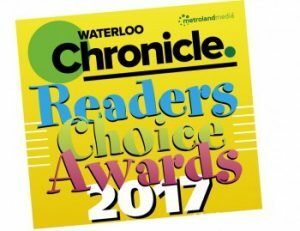 WKFA has been voted “DIAMOND Award Winner for best Martial Arts“, in the 2017 Waterloo Chronicle Readers’ Choice Awards’ Best Entertainment/Sports category! Thank you for recognizing our success! WKFA was voted “Diamond – #1 Winner for favourite local Martial Arts studio” in The Record 2015 Reader Awards again this year! WKFA was voted “Diamond – #1 Winner for favourite local Martial Arts studio” Waterloo Region Record’s 2014 Reader Awards! 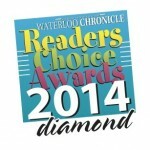 WKFA has been voted “Winner for best Martial Arts“, in the 2014 Waterloo Chronicle Readers’ Choice Awards! WKFA has been voted “Winner for best Martial Arts“, in the 2013 Waterloo Chronicle Readers’ Choice Awards! WKFA was voted “Winner for best Martial Arts“, in the 2012 Waterloo Chronicle Readers’ Choice Awards! WKFA was voted “Diamond – #1 Winner for favourite Martial Arts location” Waterloo Region Record’s 2010 Readers’ Select Awards! WKFA was voted “Diamond – #1 Winner for favourite Martial Arts location” Waterloo Region Record’s 2009 Readers’ Select Awards! WKFA was voted “Winner for best Martial Arts“, in the 2009 Waterloo Chronicle Readers’ Choice Awards! We're here to help. Call us today!